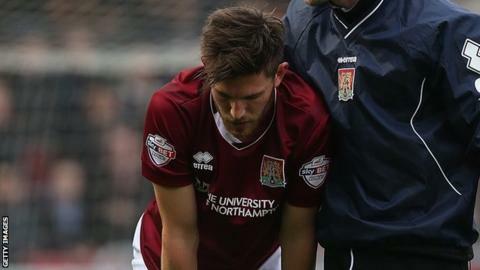 Defender Shaun Brisley has been ruled out for six to eight weeks after picking up a knee injury in Northampton Town's win against Stevenage. The 25-year-old has made 10 appearances for the Cobblers since joining on loan from Peterborough United in September. Brisley was forced off just 10 minutes into their win on Saturday. "He has got some medial ligament damage in his knee, which is disappointing because he's been superb for us," boss Chris Wilder told the club's website.